A concerned husband went to a doctor to talk about his wife. 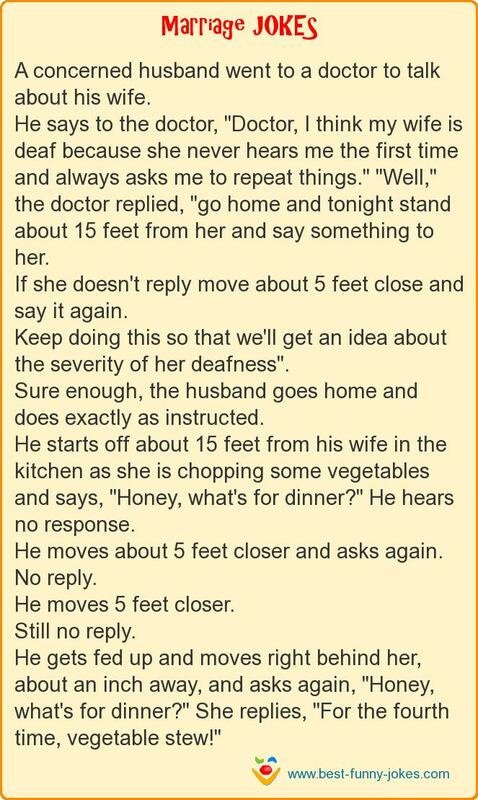 He says to the doctor, "Doctor, I think my wife is deaf because she never hears me the first time and always asks me to repeat things." "Well," the doctor replied, "go home and tonight stand about 15 feet from her and say something to her. If she doesn't reply move about 5 feet close and say it again. Keep doing this so that we'll get an idea about the severity of her deafness". He starts off about 15 feet from his wife in the kitchen as she is chopping some vegetables and says, "Honey, what's for dinner?" He hears no response. He gets fed up and moves right behind her, about an inch away, and asks again, "Honey, what's for dinner?" She replies, "For the fourth time, vegetable stew!"